What if you could get a lab test in your doctor’s office with results the same day? What if sophisticated and expensive tests to determine which mesothelioma immunotherapy would benefit you could be done quickly and cheaply? A new mesothelioma research study highlights a nanotechnology tool that could revolutionize mesothelioma research and lead to better mesothelioma treatments. A research team including scientists from the Massachusetts Institute of Technology, Nanyang Technological University, Duke University, and the University of Pittsburgh recently published a paper called “Isolation of exosomes from whole blood by integrating acoustics and microfluidics” in the Proceedings of the National Academy of Sciences. The research studied the use of microfluidics and sound waves to detect a tiny piece of mesothelioma and other cancer cells. This little cell snippet could provide the key to diagnosis and reveal characteristics and mechanisms of mesothelioma cells. 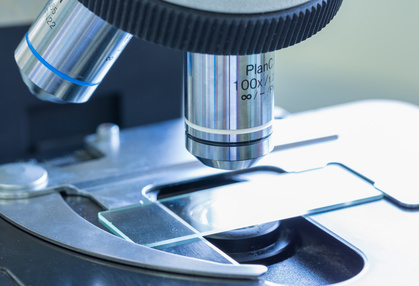 While more mesothelioma research will be needed to fully develop and deploy this technology, it’s an exciting first step in making lab tests cheaper and more accessible. It could also reduce the need for invasive tissue biopsies. Before your mesothelioma diagnosis, you probably had a biopsy – or two or three. The simplest type of biopsy is a fine needle aspiration. This is a procedure that draws fluid from the site of your tumor. Because there usually aren’t enough cancer cells in the fluid, it can be hard to determine whether you have mesothelioma based on this fluid sample from this type of biopsy. A tissue biopsy is usually needed. Another problem with fluid biopsies is that, to isolate cells within the fluid, most labs use centrifuges to spin the liquids and separate different elements. The centrifuge is a large and expensive machine. The process can take hours or even days to complete. The force of the centrifuge can damage the cellular elements that your pathologist needs to analyze and the sample may get contaminated in handling. Lab-on-a-chip (LOC) provides an alternative to this process. The LOC is a tiny chip, no larger than a few centimeters. This is the same kind of integrated circuit that powers your computer and smartphone. A tiny fluid sample, often just one drop, can be analyzed using the LOC. In the exosome study, the researchers used sound waves to separate exosomes from fluid samples that flowed through the LOC. This technique improved the purity of the micro samples they studied. Exosomes are tiny (150 nanometers or less) fat-enclosed structures inside cells. They are found in most bodily fluids. Exosomes are like the janitors of the cells they serve. They do everything from taking out the trash to transporting proteins from one cell to another. Some exosomes have been shown to change their function when a cell is threatened. Exosomes may help cancer cells metastasize. They may also help with angiogenesis. Angiogenesis is the development of blood vessels, a process that’s important to cancer cells because they need a lot of blood to survive. Exosomes may provide important clues to the nature of your mesothelioma tumor. The use of LOCs and microfluidics to quickly and cheaply isolate exosomes has big implications for mesothelioma patients. It opens the possibility for a better analysis from a fluid sample alone. This new technique could also provide access to information to unlock the secrets of your cancer cells. This has been the focus of a great deal of recent mesothelioma research. Traditional treatments for mesothelioma include chemotherapy, radiation, and surgery. Advances, especially in surgical techniques, have increased the life span for many mesothelioma patients. So far, however, mesothelioma research has not found a cure for this rare cancer caused by asbestos exposure. Immunotherapy drugs such as Keytruda and Opdivo are promising developments in mesothelioma research. Some mesothelioma patients have had terrific results from these immunotherapy drugs. Traditional chemotherapy works by attacking fast-growing cancer cells and killing them. Immunotherapy unlocks your body’s immune response at the cellular level and uses your own immune system to attack the tumor. The problem with immunotherapy treatments is that they are very specific. Some pleural mesothelioma patients may be helped by one drug while others are not. That’s because not all tumors are alike, even when they are of the same mesothelioma type. You need a treatment that targets the mechanisms your tumor uses to evade your immune defenses. Without extensive (and expensive) lab testing, it can be hard to determine what that mechanism is. The difficulty in getting the right treatment for each patient is, at least in part, a problem with diagnosis. Lab tests to determine which immunotherapy is best for you can be costly. The lab-on-a-chip method could open the door to a future where mesothelioma research combined with better diagnostic tools and targeted treatments extend the life span of many, many mesothelioma patients. Many immunotherapy treatments revolve around the use of certain proteins by cancer cells. These proteins activate pathways that allow cancer cells to avoid programmed cell death and to grow uncontrolled. Exosomes that carry proteins could play a critical role in mesothelioma research on immunotherapy treatments. During your mesothelioma treatment, as you start to follow mesothelioma research, you may come across some confusing scientific and medical terms. Here is a glossary of some of terms to help you understand this new fluid biopsy technique. Angiogenesis: The process by which your body creates new blood vessels. Cancerous tumors often need extra blood supply. Blocking angiogenesis is one way to starve cancer cells. Exosome: A type of vesicle. A vesicle is a tiny element within a cell. It is made of fluid surrounded by lipid (fat). Exosomes are found in your bodily fluids, including blood, saliva, and urine. They are 30 to 150 nanometers in size (that’s very tiny). They may transport segments of RNA and DNA to other cells, keep the cell clean, and move proteins. Under stress, they may change function and help cancer cells grow and thrive. Understanding exosomes could be a good way to better understand mesothelioma and other cancers. Lab-on-a-chip (LOC): A tiny chip (like the ones in all your “smart” devices) that functions as a mini-laboratory. LOCs analyze tiny amounts of fluid more quickly and cheaply than a traditional lab. They are much smaller and more portable than lab equipment, so they can be used in a doctor’s office or in the field. Metastasis: The spread of cancer from the original tumor to another part of your body. Mesothelioma treatments try to confine the cancer to the original tumor and keep it from metastasizing because metastatic tumors are much harder to treat and more lethal than the original tumor. Microfluidics: The study or processing of fluids on a very small scale. Microfluidics usually involves samples that are less than a millimeter across. Inkjet printers use the principles of microfluidics. These principles also allow a lab-on-a-chip to separate and analyze a small fluid sample.